Dynamic Class Referencing (DCR) is available in the Pega Customer Service horizontal layer using Data Pages. You can extend DCR to implement the approach in a new application. Create an application before you extend DCR for a new implementation layer. Use Application Express to build a new application on top of the CS-Horizontal. When Application Express runs on a customer service application, the pyDefault data transform is copied to the newly created application ruleset. The Application Express updates the following settings to your new application. To update other settings, open the pyDefault data transform of the specialized application layer and update the required properties. Click Designer Studio > Customer Service > Settings to update the application settings. 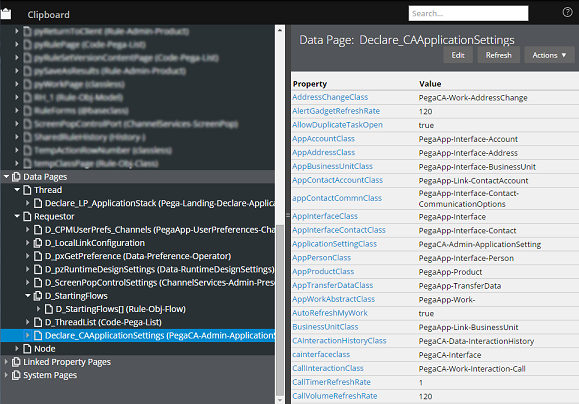 Click Update to configure application-specific properties in the data transform. Click Clipboard at the bottom of the Designer Studio to open the clipboard view of Declare_CAApplicationSettings data page.